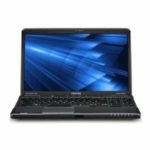 Ladies and gentlemen, today we are going to talk about Toshiba Satellite A665D-S6096, which is a 16-inch laptop outfitted with 1.7GHz AMD Phenom II Quad-Core Mobile Processor P940, 4GB DDR3 1066MHz RAM (8GB max), and 500GB (5400 RPM) Serial ATA hard drive. It sports a 16.0″ diagonal widescreen TruBrite TFT display at 1366 x 768 native resolution (HD) with Native support for 720p content and LED backlit, and an ATI Mobility Radeon HD 4250 Graphics with 256MB-1917MB dynamically allocated shared graphics memory. The laptop also comes with 8x SuperMulti DVD drive, Harman Kardon stereo speakers, Dolby Advanced Audio, 4 total USB ports with 1 eSATA/USB combo port, VGA video output, Multi-format memory card reader, Wireless-N Wi-Fi networking, and 6-cell battery (48Wh) for 3 hours of life. The laptop runs on Genuine Windows 7 Home Premium 64-bit operating system. You see, such a configuration is good enough for our daily use, people are very satisfied with it. 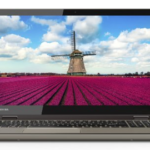 As a well-configured 16″ notebook PC, the Toshiba Satellite A665D-S6096 could be a perfect desktop replacement, so if you've been tired of your desktop PC, it's time to replace it with this one. 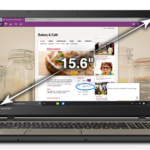 And the laptop is also great for watching movies, its bright 16-inch LCD (1366 x 768) offers a true 16:9 aspect ratio and 720p native high-definition resolution, and the A665D is great for using as a media center with the touch-sensitive media keys placed above the keyboard. What's more, the built-in webcam and Toshiba Face Recognition software on this machine lets you enjoy a more convenient way to communicate, log on or share your laptop among the family. And HDMI high-definition audio/video output allows a single cable to transmit uncompressed high-definition video to your compatible digital TV or external monitor. So I believe you guys will like this Toshiba A665D laptop, too. 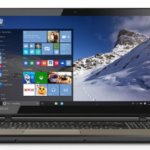 Well, what do you think about the Toshiba Satellite A665D-S6096 TruBrite LED 16-Inch Laptop?